We are a small breeder located in South Central Pennsylvania. Being a small breeder and just starting our fourth year of raising longhorns, we are constantly researching and learning as much as we can to enhance our program. As with a lot of things, it is a trial and error learning curve. We have added two herd sires. Both have exceptional genetics. We are building our program around these two up and coming youngsters. 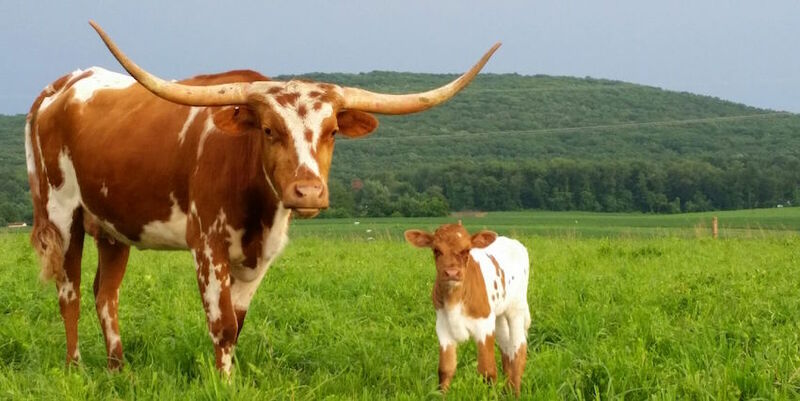 The longhorn industry is constantly growing and improving thanks to the numerous people that have fallen in love with these beautiful animals. The longhorn is considered a heritage breed that needs to be maintained and kept alive for generations to come. We are privileged to be able to be a part of this journey. We love each and every one of our animals. They come with such different colors and personalities to match. Not a day goes by that we don't take the time to enjoy our herd. It is our hope you feel the same. We have numerous visitors almost daily that range from the frequent bicyclists and joggers to the weekly buses from several local nursing homes. We invite you to look at our site and feel free to drop by for a visit if you are in the area. We'd love to chat with you. Longhorn Beef......It's what we have for dinner!